Living in a smart home provides many practical and functional advances and limitless home entertainment to homeowners and families. Systems arm themselves when no one is at home so you’ll never forget to set the alarm again. Away from home or holiday mode functions give the impression you’re home to deter intruders. Lights automatically turn on as you approach your house so you never enter a dark driveway or house. Monitor your CCTV from anywhere in the world. Smart window and door locks alert you if left unlocked when you leave the house or go to bed at night. Doors and gates can be opened to allow delivers or cleaners temporary access to your house. External intruder detectors provide early warning by displaying CCTV on TV screens and sending text or email alerts. This gives you plenty of time to get to safety and contact the police. If an intruder appears when you are on holiday, lights will switch on to give the impression you’re home. Smart heating systems learn how you live so heating is timed perfectly for when you get home. Remote control lets you to warm the house up at unexpected times or to set holiday modes from your phone whilst you are away for extended periods. All electronic equipment is hidden away in plants room and equipment racks. TV screens and speakers can be hidden when not in use so your interior design can look exactly how you want it to. 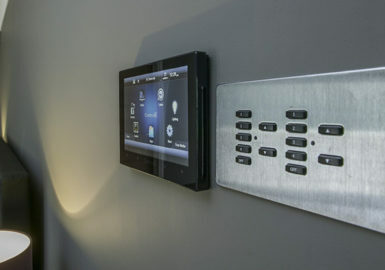 Smart home control systems only need one in-wall keypad or touch screen panel to operate everything around the house. You can even control it all from your phone or tablet so you don’t have to worry about several switches, phones or panels cluttering up your wall space. A single interface displays key functions for every electric device in your smart home so you don’t need multiple controls. You can also easily control your existing technology too. Access music from streaming services like Spotify using your smartphone independently in any room or linked throughout the house for the perfect party. Watch your favourite show in perfect 4k on every single TV in your house. All equipment is centrally located so no black boxes in any room. Cinema and media rooms let you enjoy films, sport and games in amazing quality that means you’ll never have to pay to go to the cinema again. Control everything through your phone or tablet. Parental control lets you limit TV or games console use in children’s bedrooms. Monitor energy use of all systems, sockets and lights around the house. Easily reduce the consumption of electricity by switching systems off when you are away from home or asleep so lights and TVs are never left on all day. Receive a notification of a triggered fire alarm wherever you are in the world and take swift action. If a fire or alarm sounds during the night, a smart system will activate pathway lighting to guide your family to safety. Limit unsuitable websites and your children’s Wi-Fi access with separate Wi-Fi keys.